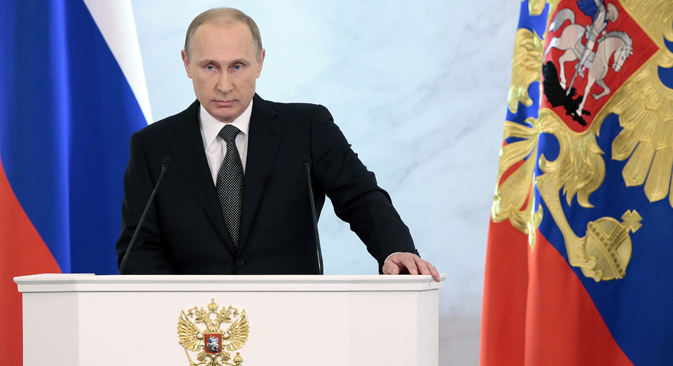 On Dec. 4, Russian President Vladimir Putin delivered his annual address to the Federal Assembly. RIR presents a summary of the Russian leader’s main points. “We don’t need to go politicking right now, to hand out loud and empty promises. Rather, we need to offer aid to the Ukrainian economy, under reforms, of course,” Putin said. “However, now they are trying by every means to convince us that this is a competent, well-balanced policy, which we must mindlessly and blindly obey. That is not going to happen,” Putin said in his address to the Federal Assembly. The U.S. continues to have an influence on Russia’s relations with its neighbors, Putin said. “It is no accident that I mention our American friends, as they are always influencing our relations with our neighbors either directly or behind the scenes. Sometimes you don’t even know who to talk to – the governments of certain countries or directly to their American patrons,” Putin said. The president pointed out what he saw as the Americans’ double standards, remarking that the U.S. only remembers international law when it stands to gain from doing so. “Understanding the role and significance of the international law we talk about so much, it should not be tailored to fit the tactical interests of some, in contradiction to fundamental principles and common sense, while they consider everyone around them to be poorly-educated people who don’t know how to read or write,” Putin said. Addressing the sanctions, Putin said the policy of containment against Russia is not connected with the events in Ukraine. According to him, it has been ongoing for many years. “We remember very well who supported separatism and even outright terror here and how they supported it, practically out in the open. I called them murderers whose hands were stained with blood, not just rebels. I took them to a higher level,” Putin said. “We were left with no doubts that they would have been glad to let the Yugoslavia scenario of disintegration happen here, and dismemberment with all the tragic consequences. That didn’t happen. We didn’t allow it,” he added. “Stable work continues on the creation of a global U.S. missile defense system, especially in Europe. That is a threat to the security not only of Russia, but of the entire world because of its potential disturbance to the strategic balance. I won’t go into details here, but I will say one thing: We have no intention of being drawn into a costly arms race. That said, we will ensure a reliable and guaranteed defense capability for our country under any conditions,” Putin said. “We ourselves will never take the path of self-isolation, xenophobia, suspicion, and the hunt for enemies. That is all a sign of weakness, while we are strong and confident. Our goal is to acquire as many equal partners as possible in both the West and the East,” Putin said. “We see how rapidly the Asia-Pacific region has been moving forward in the last few decades. As a Pacific power, Russia will fully utilize this huge potential,” he explained. Putin suggested locking the current tax system in place and not changing it for the next four years so that entrepreneurs can breathe easy and not fear any unpleasant surprises from the government. He also promised to grant full amnesty for offshore capital on the condition that it is brought back to Russia. Putin also addressed the topic of bureaucracy, assuring that Russia would soon adopt measures to prevent excessive control over business operations. “The government should adopt all the necessary solutions for switching to this system in 2015,” he said. According to Putin, Russia’s top banks are to receive capital from the National Welfare Fund so they can lend to investment projects in the real economic sector. “Using our resources, primarily from the National Welfare Fund, I propose implementing a program to recapitalize the leading domestic banks. Money would be provided to them on principal conditions and go towards lending to the most valuable projects in the real economic sector at affordable interest rates,” he explained.